Dealing with outliers and assessing their impact. Even after correcting or excluding all result known to be spurious, there may sometimes be results marked as statistical outliers. This may be due to a nonperformance-related cause, which, if known, would have justified excluding the result. Alternatively, the apparently extreme results may genuinely represent the performance. There is always a trade-off between retaining the result which will inflate the imprecision estimates, or exclude it which may overly optimistic estimates. It is often good practice to calculate the results before and after excluding the outlier. The dataset worksheet activates and the analysis task pane remains open. On the Descriptives panel, select the Exclude identified outliers check box. On the analysis task pane, click Calculate. A new analysis report open. The variability plot show the excluded observation as a red cross. 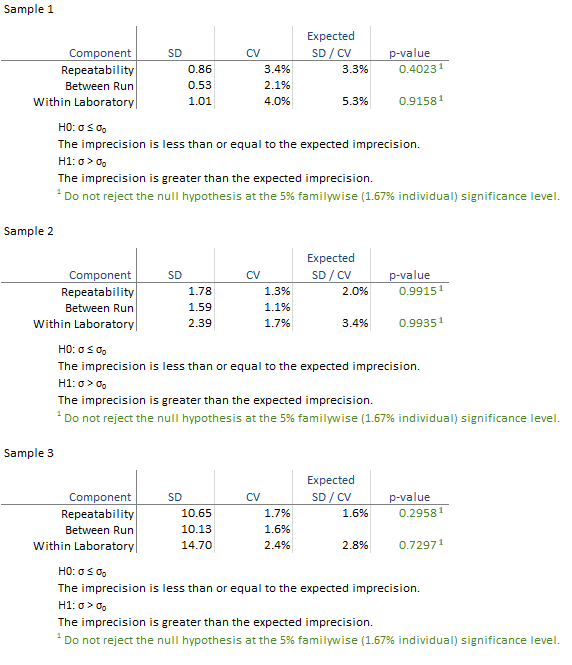 All the hypothesis tests are not significant and highlighted green. Because the exclusion of the outlier changes the outcome of the study it is essential to assess the clinical effect of the outlier and investigate further to try and determine its cause, or contact the manufacturer for further assistance in diagnosing the problem.